Question: How should parents address their children when they interrupt adult conversations? Answer: It is hard to understand that the whole world does not exist for your own pleasure and purpose when you are young. A child’s feelings of excitement, anger, fear and frustration explode from within them and adults can physically see the results of their immature nervous system at work when children erupt with urgency no matter that you are in the middle of a conversation, phone call or other pressing task. When I was young, I recall interrupting an adult, the adult then turning to me and saying loudly for all to hear with annoyance, “In-terr-upting be-havior” and then turning around only to ignore me. No matter my shame and embarrassment at being addressed in this way in front of a group, I required this adult’s attention and I persisted to obtain it. The labeling/shaming tactic was very ineffective and left both us feeling angry, annoyed and embarrassed. Yes, I knew I was interrupting, but I needed the adult’s attention and I had no idea how to obtain it properly. I just wanted to be acknowledged and it was very hard to wait my turn. 1st- The first important thing to keep in mind when a child interrupts you is that the young child is behaving in a developmentally appropriate way. All matters exciting and upsetting feel urgent to a child. They often do not understand when adults do not share their urgency in addressing their concerns. 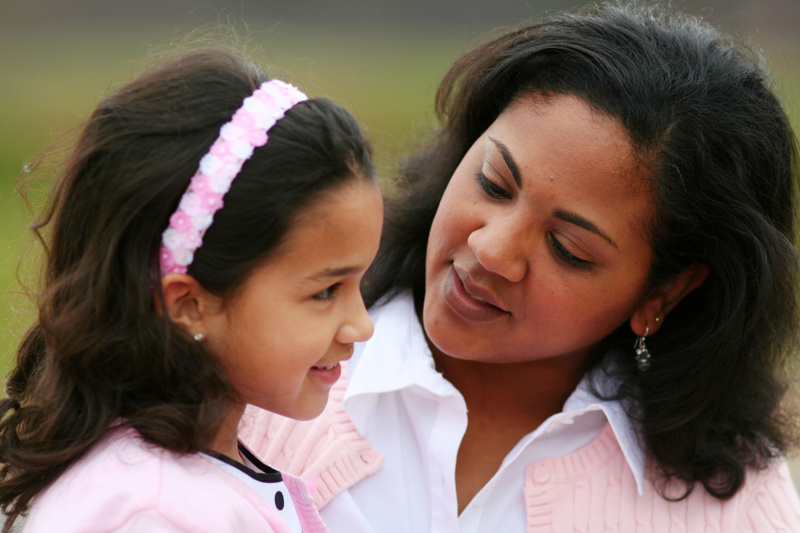 2nd- Next, avoid shaming the child for interrupting and instead seek to teach the child how to alert you that they would like your attention and, most importantly, help them practice waiting to obtain it. 3rd- Finally, do not give in to a child who is using public interruptions/outbursts to manipulate you. There is a difference between interrupting and manipulating via tantrum. A good friend of mine and former teacher wisely asks her children to squeeze her hand to let her know that they want to speak with her when she is talking to someone else. The hand squeeze is a non-interruptive and non-verbal form of communicating that “I’d like to talk to you soon”. Brilliant idea! Young children can easily be taught to take this first step. Have your children practice how to do this at home, before interrupting occurs. How do adults interrupt others when necessary? We say, “Excuse me please” or “I’m sorry to interrupt, but…”. You can teach your child socially appropriate phrases to use when interrupting is necessary. When they want your attention but the matter is not pressing they can ask you, “Can I have a moment?”. My little ones use to just say, “Moment Mama?”. The question allows you to say or nod “yes”, “no” or “wait” and is minimally disruptive. The real challenge is to now teach the child to wait after notifying you that they require your attention. Young children will have difficultly waiting and will soon erupt if do not acknowledge their attempt. Give the child eye contact, a nod or a gentle squeeze back when they attempt to get your attention as failure to respond quickly to a young child’s attempt can result in angry attempts to alert you to their cause. Then try to give a young child your attention soon after their attempt. Most young children will only be able to wait for about a minute, possibly two minutes, when they have something to say. Any longer and they will forget what they had to say or they may feel genuinely offended. Rewarding an attempt to interrupt you politely will encourage the child to use the polite system and not regress to less polite methods. Learning to wait requires self control (see IN article Self-Control) and self control will take time and practice to acquire so be patient, persistent and understanding in helping your child learn to wait. One reason that children interrupt adults often is that they really believe that what they have to say or ask is WAY more important than whatever you are talking about with another adult. Sometimes the interruption will be more important (think bathroom emergency or baby brother is about to swallow a marble), but most of the time, from your perspective, it will not be. Help teach your child what is an emergency that requires an occasional interruption and what can wait. Children will understand instances that can wait if you help them to empathize with your perspective in the situation. They also respond to black and white rules- bathroom emergency is OK, showing me that the crayon broke is not. Keep in mind that empathy is hard for little ones. Their wanting you to push them on the swing will be monumentally more important in their mind than you getting the updates on your neighbor’s home renovation at the park. Empathy is a work in progress (see IN article Empathy By the Ages). Young children know that they have power, despite their small stature, and they know how to use this power to get what they want– think public tantrum. The only way to stop excessive and, I dare say, aggressive interrupting is to never give a child what he/she wants when they ask or interrupt in a rude way. Swallow your pride when the waiter at the restaurant rolls their eyes and your friends begin to whisper. If your child bursts into your conversation and demands your attention, resist offering it to him only to appease his fury. Quietly whisper to the child that if she/he wants to talk to you then he will have to ask nicely and wait his turn. Be ready to remove the child from the area if they persist in exploding. Ask the child to come back and try again when they are ready. When you first begin, you may need to do this several times per incidence and the child will likely fight your attempt to teach them. Stay calm and do not give in as changing the status quo is confusing and upsetting to the child. Quiet conversations are still a long way off if you have little ones, but there is always room for improvement. Be ready to stay calm and use interruptions as a means to teach your child about social skills and you will see “interrupting behavior” dissipate.